IT Sligo was delighted to confer the first graduates from the new MEng in Road and Transport Engineering. This programme was launched in 2016 in collaboration with the Local Authority Services National Training Group (LASNTG) and the Department of Transport, Tourism and Sport and is delivered online on a part time basis. 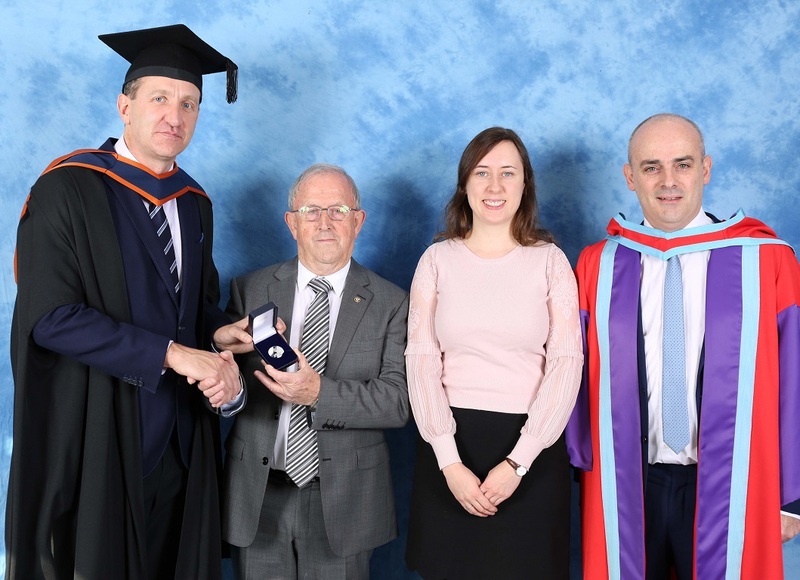 The graduate who was the recipient of the Governing Body Medal (sponsored by LASNTG) as a result of achieving the highest overall result was Mr Alan Lowe. Alan works in Roadstone and is the Senior Technical Manager. When selecting the MEng dissertation, Alan wanted to focus on a research area that he had an interest in and one that could potentially provide some benefits to his employer. The title of his dissertation was "The Impact of Recycled Concrete Aggregates on the Strength and Workability of Infrastructural Concrete". The use of recycled concrete aggregates has the potential to enhance the sustainability of ready mixed concrete and to also reduce the volume of concrete waste that is sent to landfill. The laboratory based research that he completed provided a platform for full scale recycled concrete aggregate processing trials in Roadstone. A number of concrete mix designs incorporating recycled concrete aggregates have now been developed with full scale concrete production planned for 2019. Dr Tomas O’Flaherty, lecturer at IT Sligo was Alan’s dissertation supervisor and together they wrote and presented a research paper as an outcome from this research at the 2018 Civil Engineering Research in Ireland conference (CERI2018) organised by the Civil Engineering Research Association of Ireland (CERAI) along with the Irish Transportation Research Network (ITRN). See http://www.cerai.net/ for further detail. Further information about this and other construction related part time online programmes can be found at https://www.itsligo.ie/onlinelearning/ or call telephone 07191 55222.